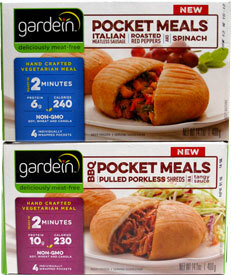 Get ready for Gardein's newest creation - BBQ Pulled PorklessPocket Meals! They're soft dinner rolls filled with savory Gardein pork alternative and spices that are ready in as little as 2 minutes in the microwave (they can also be baked in the oven for a crispier crust). They're made with GMO-free ingredients and give you a whole new way to enjoy delicious plant-based protein on the go in a hurry. Each box of Gardein Pocket Meals contains 4 individually wrapped pockets that are handy for a quick meal at home or on-the-go. 14.1 oz. (400g) boxes of 4 Pocket Meals are $6.49. From Anonymous of Irvine, California on 9/19/2017 . I tried the BBQ pork buns for the first time today and they are good. I was impressed. When you buy things sometimes it is hit and miss. This is definitely a hit. I would buy again. From Bailey of Hendersonville, Tennessee on 8/25/2016 . Gardein just gets better all the time. Just when you think they can't get better, they come out with something new and improve on perfection. Already impressed with their previous offerings (highly recommend their sliders! ), I had some pretty high expectations for the BBQ pulled porkless pockets, and they did not disappoint! These are the perfect, savory, satisfying, ultra-indulgent food you hide in an empty container of something else so your family doesn't find it and beat you to it. I can't wait to try their other flavors. From Tanesha of Battle Creek, Michigan on 4/6/2016 . I am super excited about these they are amazing!!!!! I WILL be keeping these in my freezer!! Best *meatless* food I've found yet! From Anonymous of Bradenton, Florida on 2/12/2016 . These are so good and so *real*. My husband is an avid herbie and when he found this in his lunchbox, he called me - extremely upset - after spitting out his first bite because he was very much under the impression that he had just eaten real pork. Any meat eater would love these and most likely not even know they weren't eating meat. The sauce is good, they're delicious! ...and when paired with my coleslaw, they're what's for dinner! From Anonymous of Shelby, North Carolina on 7/6/2015 . This little pocket sandwich is so good! I follow the directions for microwave & toaster oven and it comes out perfect! This will be a staple in my freezer.